Matthew Pringle has served as Europe and Central Asia Program Officer at the Association for the Prevention of Torture (APT). In the interview with Ferghana.ru he evaluates current situation with tortures in Uzbekistan, explains what APT does in this regard and what could be done to improve the situation. 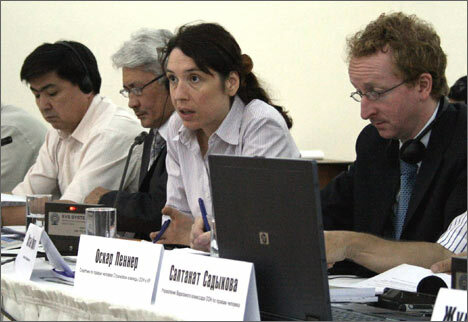 Ferghana.ru: How do you evaluate situation with torture in Central Asia? Matthew Pringle: The fact that all Central Asian states joined the Convention against Torture and its Optional Protocol and willing to introduce international standards into their respective legislation systems is a very positive sign. However, this should not remain on paper only. We expect further cooperation between civil society, obliged to monitor, and the government that has to follow provisions of the both documents. For provisions to be implemented and followed there should be an effectively working mechanism, commitment of all parties involved and political will. Georgia could be a good example as monitoring mechanism in this country proved to be very efficient and situation with torture has significantly improved. Kyrgyzstan on this initial stage could be also a good example for Central Asian states. Ferghana.ru: Does Uzbekistan follow any provisions of the Convention? Matthew Pringle: Uzbekistan is an extreme example of violation of the fundamental principles and rights of people who experienced torture or degrading treatment. These people usually face obstacles in claiming their rights, including limited access to professional lawyers. In theory, any case involving alleged torture should be investigated by police. However in reality this does not happen because the government is not interested in punishing those guilty. If there is no such interest there is little hope for improvement. Tortures in Uzbekistan are hard to eliminate under the current political regime which allows these atrocities. However, despite absence of the open dialogue between Uzbek government and civil society we are trying to monitor the situation as close as we can. Ferghana.ru: Did the monitoring intensify after the 2005 Andijan events when, according to human rights watchdogs, hundred peaceful protesters were killed by the Uzbek military forces? Matthew Pringle: Association for the Prevention of Torture has been monitoring Uzbekistan since 2004. Before Andijan events the situation with torture was as bad as after. However, attention from the international community increased after Andijan. Ferghana.ru: Is international community able to influence Uzbekistan regarding the use of torture? Matthew Pringle: Yes, it can, and primarily through fair monitoring. However, most of the organizations, except for the International Committee of the Red Cross, have no access to penitentiary system to conduct thorough evaluation. Uzbekistan in this regard is an extreme example and has to be treated carefully. UN special rapporteur on Uzbekistan has recently said that torture is 'routine' in this country. Importantly, this is the worst definition in international classification and could be interpreted as a conscious endorsement of torture by the state. Ferghana.ru: Is it realistic to expect improvement of the situation with torture in Uzbekistan? Matthew Pringle: If there is no hope for improvement there is little motivation. So, yes, we are hoping that Uzbek authorities will listen to criticism and next time there will be good news from Uzbekistan and we will be able to protect human rights in the country without restraints.